I was finally able to finish my Tim Holtz 12 tags of 2013 April tag before the end of the month. On this tag Tim was demonstrating the "look of patina" on a variety of surfaces using the distress paints. OH, MY!! 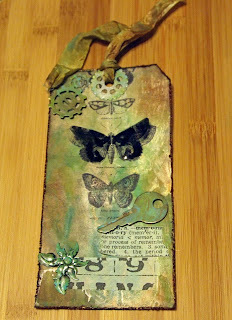 This tag has to be RIGHT UP THERE with my VERY FAVORITES!! Donna, the color and texture variations are STUNNING! !